How has practicing Ashiatsu impacted your career? Incorporating ashi into my practice meant trusting my clients were going to trust me. I still needed to make a living, but people can get "weird" about feet and trying something new with their massage. If they know what they're getting, and they like it, it can be difficult to try something new. Incorporating ashi not only created a better trusting relationship with my clients, but it has also made me more reputable in my community by doing something incredibly unique and beneficial for someone's body. What advice can you give to new graduates? Practice and get feedback! Practice with other ashi bodyworkers, practice on your trusted friends and family and ask for feedback and be able to listen. I still check in with my clients who have been receiving ashi for months. I like to try new moves techniques and the feedback is the difference between someone who knows ashi, and someone who is a great bodyworker. You can practice a move 100 times the wrong way and you'll never know if you're too afraid to ask for feedback on how something feels too different people. Right away I want to list off 4 different stokes and it's really hard to choose, but I think if I had to pick one, it would be chest work while the client is supine. Some of the most dramatic structural differences are results of comfortable, slow, deep chest work which is unparalleled to having fist or elbow in someone's chest that is really tight. What was your fondest memory of your DeepFeet Training? Meeting the people involved with Deepfeet! I loved meeting Nancy for the first time in Las Vegas, I loved meeting with my trainer Christy Bebout (parker, CO) who is an amazing instructor and lives close by, so not only is she my personal massage therapist, she's become a really good friend. Having a community on standby makes a huge difference in my daily practice and passion. How has your barefoot practice evolved since your training? My training with Deepfeet was the final puzzle piece to my fast growing private practice. My practice was 100% different before doing ashi. It was elevated my practice, my relationships with clients and other business owners, my brand, everything. I am constantly "perfecting" my techniques I learned in Deepfeet as well. I regularly refer to my notes from training because everything was fresh new and exciting and I don't want to forget anything. Also willing to get creative with certain moves and put a few little twists into some strokes here and there. 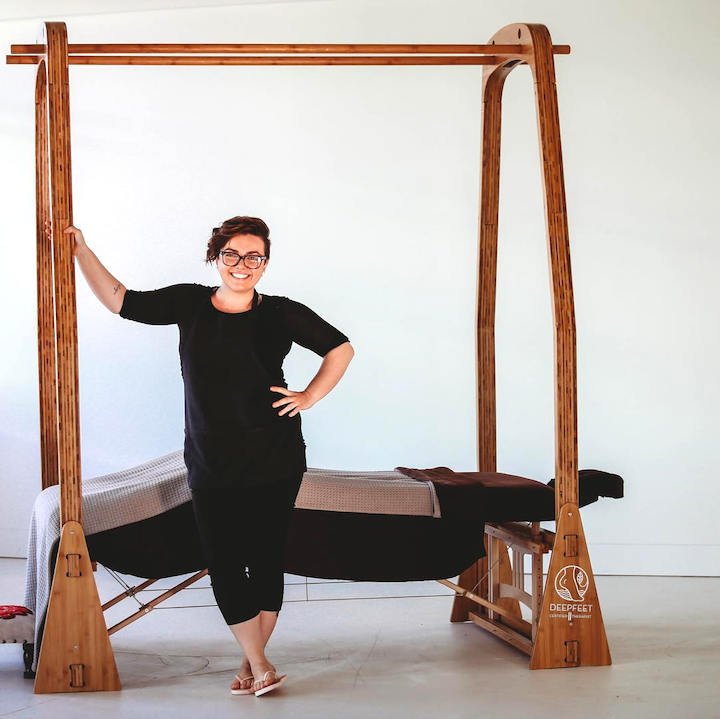 My ashi practice is truly unique because I also combine my Deepfeet training with orthopedic and structural massage trainings to create customized sessions for every single person who gets on my table. Very seldom do I find the answer to someones pain is just one modality or just one type of massage. Its a combination of different tools that work best for your client and your own body.